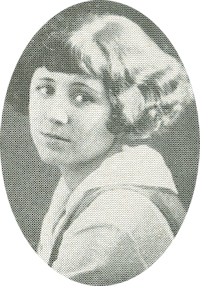 Obituary – Newton, Elizabeth (Woods) « Perry High School Alumni Association, Inc.
﻿Red Hot; Basket Ball ’21, ’22, ’23, Captain ’24; Junior Play ’23; Peroma Staff; Philomathean; J. F. F.
This lass is full of fun. ﻿Life-long Perry area resident, Elizabeth Newton, 81, 1705 Park lane, died at 2 p.m. Tuesday at St. Francis hospital at Tulsa. Funeral will be at 2 p.m. Friday at the First Christian church. Rev. Jack Oliver, Tulsa, former pastor of the Perry church, will officiate. Burial will be at Grace Hill cemetery under direction of Brown Funeral home. Mrs. Newton was the daughter of George and Leota Woods and was born Jan. 15, 1907, at Perry. She was a 1924 graduate of Perry high school and married G. D. “Ted” Newton on June 14, 1924. She and her husband owned and operated Newton Funeral home in Perry. Newton preceded his wife in death in 1983. 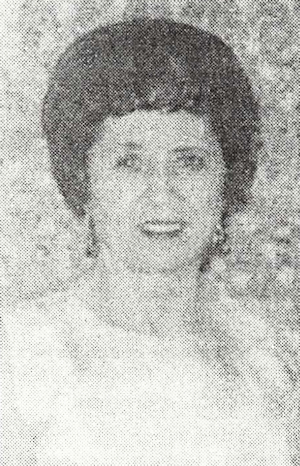 Mrs. Newton was a member of the First Christian church, was a past worthy matron of the Order of Eastern Star, was past president of the Perry Women’s Golf association and was a member of the Perry Progress club. Among survivors are two sons, Jack Newton, of Perry; and G. W. “Bill” Newton, Tulsa; two sisters, Edna McKay, Ponca City; and Jane Woods, Perry; five grandchildren and four great-grandchildren.